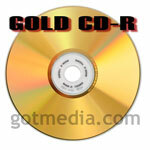 GotMedia.com sells a full line of MAM-A Gold CD-R media, and MAM-A Gold CDs are the ideal CD-R for professional mastering and archiving. A Gold CD-R has a 24 karat gold reflective layer that improves data/audio accuracy and greatly improves the longevity of data integrity. MAM-A Gold CD-R has a life expectancy beyond 300 years. Gold CD-Rs are highly resistant to oxidation which has been determined to be the cause of data integrity, thus making MAM-A Gold CD-R the only choice for professionals who archive data and audio. MAM-A stands for Mitsui Advanced Media of America. Many professionals still refer to MAM-A as Mitsui. They are both the same company. 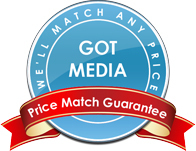 MAM-A is considered by many professionals to be the best blank media manufacturer in the world. MAM-A controls every aspect of production from raw materials to finished packaged product. This control allows MAM-A to perfect the manufacturing process and more importantly to consistently produce blank CD-R media at the highest quality. MAM-A Gold CD-R Media is considered the best, so be sure to check out our line of MAM-A BD-R Media and MAM-A DVD-R Media products as well! The MAM-A 41501 has a gold matte finish top surface which can be used for monocolor thermal printing or using a CD safe Pen. Gold CD-Rs have a 24 karat gold reflective layer which improves the recording accuracy, ensures longevity and has the most resistance to chemical breakdown and oxidation. MAM-A Mitsui Gold CD-R has a reputation that is synonomous with superior quality. This Mitsui Gold CD-R is a 650 MB/ 74 Minutes capacity and has a gold matte finish surface for users that want to print with a monocolor thermal printer, apply a label or just simply write on the surface with a CD pen. MAM-A Mitsui Gold CD-R has a reputation that is synonomous with superior quality. This Mitsui Gold CD-R is a 650 MB/ 74 Minutes capacity and has a shiny gold surface for users that want to print with a monocolor thermal printer, apply a label or just simply write on the surface with a CD pen. These are packaged in a Jewel Case. MAM-A White Inkjet Gold CD-Rs are for users that want to print with a color inkjet printer, or just simply write on the surface with a CD pen. Gold CD-Rs have a 24 karat gold reflective layer which improves the recording accuracy, ensures longevity and has the most resistance to chemical breakdown and oxidation. MAM-A Mitsui Gold CD-R has a reputation that is synonomous with superior quality. This Mitsui Gold CD-R is a 650 MB/ 74 Minutes capacity and has a clear coat inkjet printable surface for use with a color inkjet printer. You will be printing over a gold background since the inkjet coating is clear. You can also write on the surface with a CD pen. MAM-A Gold Color Thermal Gold CD-Rs have a clear thermal coating on top; for users that want to print with a color thermal printer, or just simply write on the surface with a CD pen. MAM-A Mitsui Pro Audio Gold CD-R is made specifically for Professional Mastering Studios who need to burn audio masters for their clients. MAM-A also makes this audio CD-R for older CD burners that use ATIP and may not be compatible with newer high speed CD-Rs. This Mitsui Audio Gold CD-R does not have SCMS. Inkjet Printable MAM-A Mitsui Gold Digital Audio CD-R 11349. The MAM-A 11349 has a white inkjet printable surface for users that can print directly on the surface of the CD-R with an inkjet printer. It has a stack ring and isn't hub printable. It also has SCMS which makes it compatible with standalone home audio CD burners. Packaged in a jewel case. The MAM-A - Mitsui Gold CD-R 45501 has a 700 MB/ 80 Minute capacity and has a gold matte finish top surface for users that want to print with a monocolor thermal printer, apply a label or just simply write on the surface with a CD pen.